It’s mango season, guys! A bunch of dessert parlors and restaurants in the city are all ready to serve this season’s special delicacies and we have got all the juicy details for you! With over 9 outlets in the city, this juice centre, is serving more than just fresh mango juice this season. While they have the classic mango smoothies, their faloodas and fresh cream desserts are what we went ahead and experimented with. This season we recommend that you check out their Mango Falooda packed with layers of flavours starting at INR 145. And if you like your falooda creamy, their special Mango Falooda cream is a bowl full of heaven. What we loved the most were their Mango With Ice cream and the Fruit Cream bowls. Mouth watering dishes of the menu! Popularly recommended, their cream bowls with fresh fruit is lip smacking to the say the least. This tiny juice corner located near Co-Optex in T-Nagar is quite a find. The age-old place serves some really yummy mango shakes and is very pocket-friendly. While their mango juice is fresh and filling, the Mango Smoothie and Jackfruit payasam beat them all. Their smoothie topped with extra pieces of mango is everything we need for dessert this summer. You can also eat it like dessert if you wish to. Super creamy and thick! Remember Chennai’s first fruit popsicle kiosk? The popular corner is now serving our favourite flavour! It’s time to ditch the classic flavours and indulge in their New Alphonso Mango popsicle. The chilled and bright yellow stick can also be made quirkier with choco-chips and other saucy toppings. These frozen popsicles are our favourite way to beat the summer heat. Oh So Stoned’s seasonal delicacy is now available and it is quite a mix of our favourite flavours. Their Mango Lychee is the hot pick of the season and gives your taste buds the right fruit punch. The base is a creamy mango ice cream topped with lychee pieces and desiccated coconut! Yum, isn’t it?! You could also just stick to their plain Mango ice cream to satisfy those sweet tooth cravings. It’s time for some Thai-style mango! Their Sticky Rice With Mango is a traditional Thai dessert made with mangoes, fresh rice, and some coconut milk. It is eggless and definitely for peeps who are in the mood to experiment with the king of fruits! We like. It’s raining mangoes in Pantry D’or! The popular pizza joint has an extensive Mango menu, for summer only. From mango-based salads to desserts, there is nothing a mango lover won’t find here. Their season special menu includes some Mango salad, to begin with, and then you could move on to some Potato skin with creamy mango salsa for starters. That’s not it, they also have some heavy main course dishes, that too with Mango! Non-vegetarians can dig into their fusion Chicken curry with Mexican rice and mangoes, while vegetarians your paneer just got a twist. Do check out their Thai mango paneer curry with Mexican rice and end your meal with the Mango kulfi. Since we’re mostly talking about desserts for this listicle, they have mouth-watering some rabri mango kulfi slices, to fill you up! Now, what’s summer without some chilled lassi? And how about lassi with a dash of mango? Slurp! We tried out the rich and creamy Mango Lassi in Ajanabi during our stroll at Fountain Plaza and it’s divine! Known for its chaats and sweets, Ajanabi’s Mango Lassi priced at just INR 65, is a small glass full of flavour, worth trying out! While you’re there, you could also taste their refreshing Fruit Faloodas. Imagine waffles and mini pancakes topped with delicious mangoes? Tempting for sure! We found exactly that at That Waffle Place this summer. 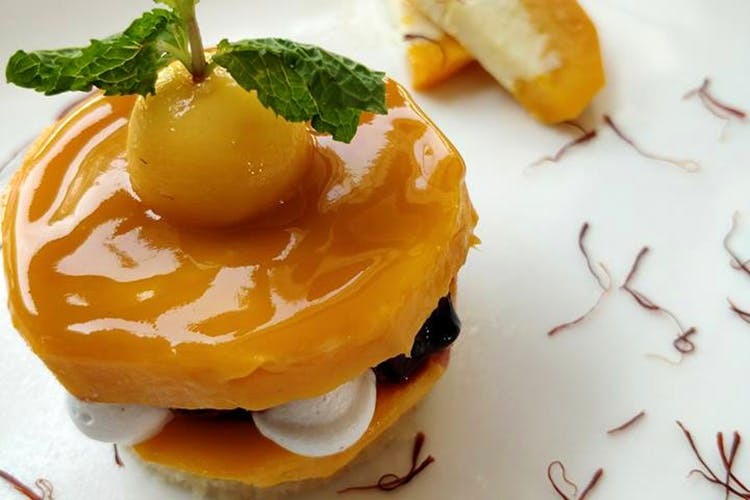 Their special menu for the season, has the Magical Mango Waff-Wich, Fresh Mango Ice Cream Waff-Wich and even Mini-Pancakes with fresh and juicy Alphonso mangoes. Price: Starting INR 150.